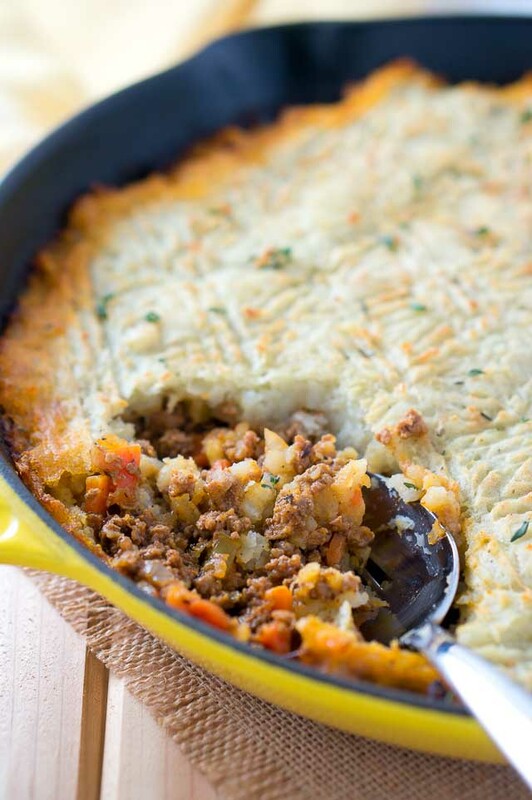 Easy Skillet Shepherd’s Pie – a deliciously rich and hearty beef and vegetable meal covered with a blanket of mashed potatoes and baked to perfection. Old fashioned goodness! This is so comforting and filling, it tastes amazing and everyone will want seconds. True comfort food! 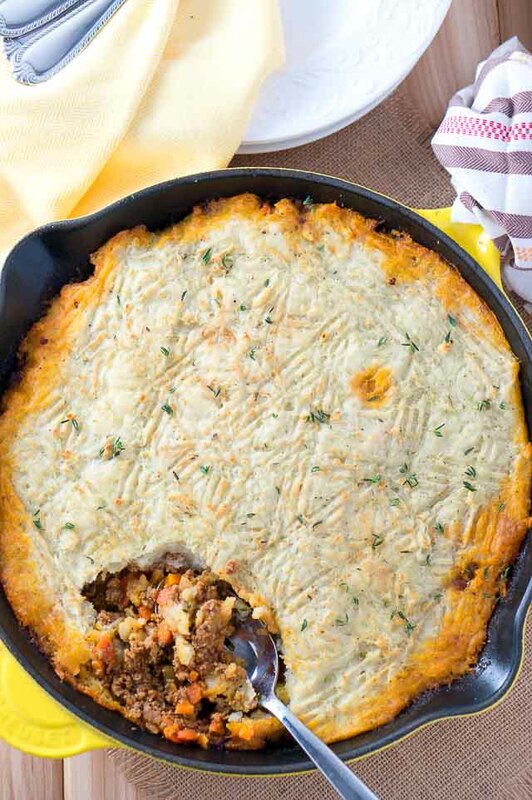 This Easy Skillet Shepherd’s Pie is a great dish to make ahead, freeze and bake when you are ready to eat. 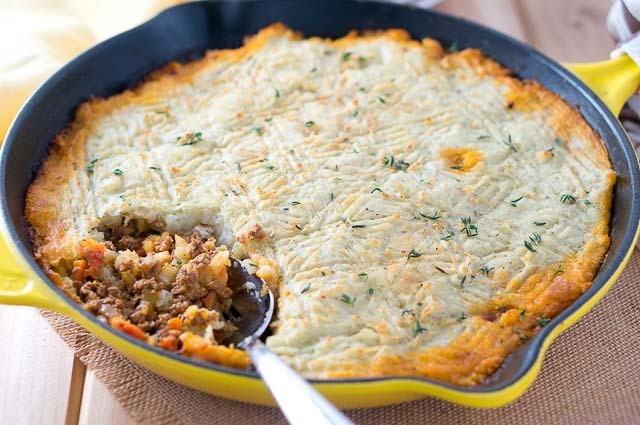 You can also make this with chopped turkey in place of beef, or sweet potatoes in place of regular potatoes if you are looking for a Paleo Shepherd’s Pie. If you want to keep the carbs low, top it with cauliflower mash instead. Leftovers freeze well and can be reheated later. This meal filled with grass fed ground beef, vegetables and topped with mashed potatoes would be perfect for all you meat and potato lovers out there. You can also bake this meal in a regular baking dish. After you brown the ground beef and saute the vegetables, transfer them to a greased baking dish, top with potatoes and bake at 350 F.
Heat oil over medium-high heat in a cast iron skillet. Brown ground beef in the skillet for about 5 minutes. Stir in chopped carrots, onion, celery stalks, and minced garlic to the ground beef. Cover and continue cooking, stirring occasionally, for about 10 minutes, or until vegetables are tender. Preheat oven to 350 F. Pour in tomato paste and vegetable broth in the skillet and stir everything. Season to taste with dried oregano, fresh thyme, salt and freshly ground pepper. Cover and simmer for a couple of minutes, until most of the juices have evaporated. Remove from heat. Even out the vegetable mixture in the skillet, and spread out evenly the leftover mashed potatoes over it. If you are using a narrower baking dish, you might need less mashed potatoes. Make sure the mashed potato topping covers the vegetables. Place in the preheated oven and bake for 15 minutes. If you wish, you can place the skillet/baking dish under the broiler for the last 4 minutes. Make sure to watch it closely as it can burn quickly. You can garnish with fresh thyme before serving. 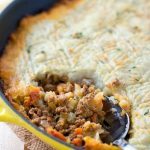 Easy Skillet Shepherd's Pie - a deliciously rich and hearty beef and vegetables meal covered with a blanket of mashed potatoes and baked to perfection. 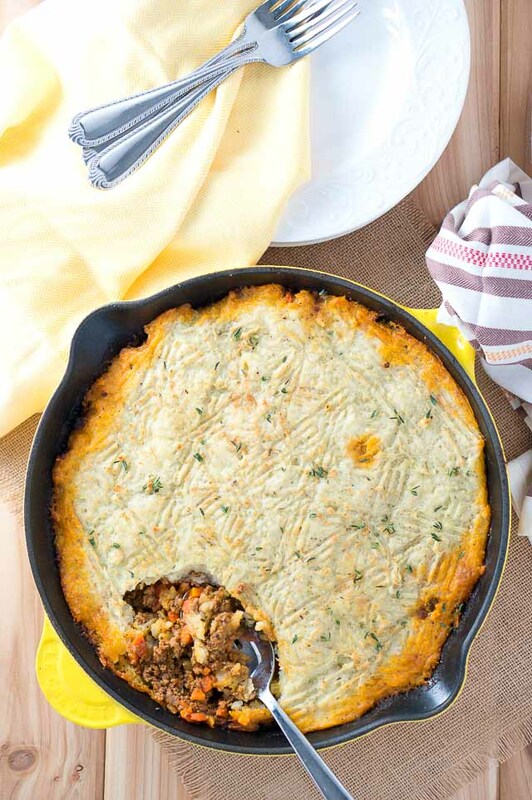 Shepherd’s pie is a favorite in our house but I never do it all in the skillet. Definitely trying this next time it’s on our menu. This looks amazing! Perfect for dinner!